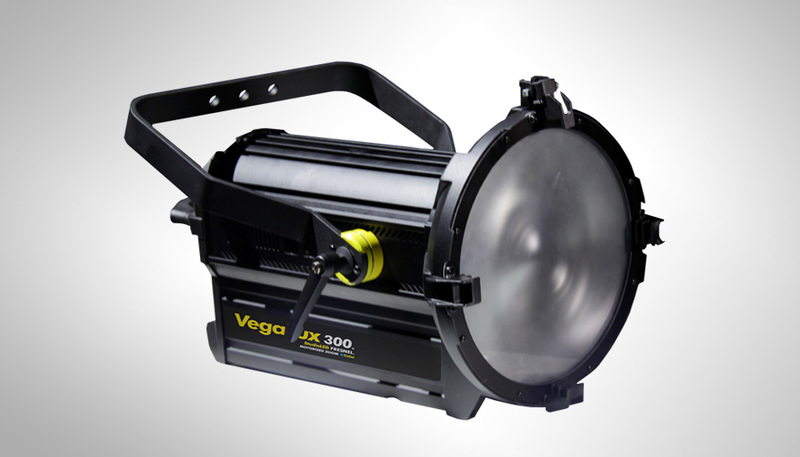 The VegaLux 300 StudioLED Fresnel includes the Nebula Diffusion Chamber Technology system, mixing and diffusing the light rays of each LED and emiting a pure white light output, specially designed for broadcast & motion picture applications. The light uses two two sets of powerful white LEDs with high TLCI Index and CRI+90 that works in the 3200K-5200K CCT range. The LEDs are set in a sink with a system of low-noise fans, for heat dissipation and protection and placed on a Circuit Breaker MPCB with low thermal resistance, an electronic active temperature control system prevents thermal conditions of stress in order that the LEDs operate at their best performance. The VegaLux 300 delivers a luminous flux of equivalent incandescent lights with power requirements of 2000W, while using only 338W. ​The unit is DMX controllable with motorized zoom, allowing its beam angle to change from spot 160 to flood 430. You can have up to five (5) 300W 2.81A VegaLux 300, Fresnel lights connected to a 20A, 120VAC house outlet without breaking a fuse, compared to just one 2,000W inefficient incandescent fixture. The VegaLux 300 emits the pure white light needed for professional applications, so you can substitute your inefficient fixtures right away, manufactured with world class industry standards, it is a highly professional, dependable and simple to use fixture, that can be seamlessly integrated with all kind of lighting fixtures into your current production’s workflow. Will save between 75-80% of the cost of your electric bill, and because LED is a cool digital light, you will also save costs, eliminating the need of air conditioning for your studio. The new light will be on display in Central Hall Booth C6513.